Un crucero de una noche por el espectacular Milford Sound es una experiencia única. A bordo del Milford Mariner, recorrerá todo este espectacular fiordo hasta el Mar de Tasmania, para después anclar durante la noche en la zona protegida de Harrison Cove. Overall a lovely experience, however I believe the timing needs to be revised. Although interesting there are too many stops en route from Te Anau to Milford, lots of waiting to get on the bus and get on the boat resulting in too little time on the boat. Let's face it, the cruise is the main event and getting on board by 3.30 pm and off at around 10.30 would be excellent. The entire time on the fiord felt rushed - we boarded at 4.30 after a safety briefing we powered madly part way up the fiord to an anchor for the night and in the morning we were powering again at full speed to the Tasman Sea in pitch darkness 7 am only to reach the mouth in half light, to swiftly turn around head back to the wharf by 9.10 am to wait again for the bus. The time on the fiord in the tender boat was interesting but again very short and restricted to one bay. Dinner and breakfast were delicious, the staff were very helpful and informative and the cabin was functional and clean. Coffee was shut down about 8.15 am meaning we had to travel all the way back with no morning coffee break - tough for addicts :. I would recommend the experience however be aware it is very quick!! Although the scenery was amazing, the 'overnight cruise' was a disappointment. After boarding we cruised for about 45 minutes before mooring for the night within a mile of the dock where we'd begun the trip. Cruising began again at dawn and was finished by just after 9am. Brilliant. Excellent tour. Lots to see, good food and well looked after by a great crew. Great having dolphins swimming alongside for 30 minutes too. Could have reached out and touched them. 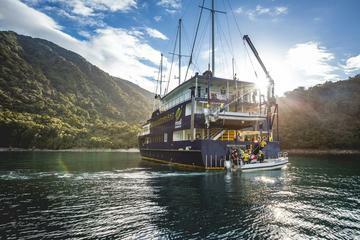 Our trip on the Milford Mariner overnight cruise was magical from start to finish. The crew on board were so helpful, nothing was a bother. The cabin was very good and the food terrific. This would have to be the best part of our recent South Island trip. I would recommend this overnight cruise to anyone. This was a highlight of our trip. cabins great, staff great, food beautiful, Milford Sound is just an amazing place. This trip was more than we could ever have imagined. We had a fantastic time. The scenery, the food, the wine and the staff were outstanding. I would definitely recommend this trip to anyone! Absolutely fantastic- the highlight of our trip to New Zealand- the bus ride to Milford Sound was incredible ( glad we decided not to drive ourselves), great views and excellent commentary. Overnight on the Mariner was excellent- delicious food, comfortable cabins and the commentary from staff was knowledgable and very entertaining. I will never forget our trip to Milford sound- surely one of the wonders of the world. Overall the experience was wonderful but was mislead into believing it was 2 days. However, the cruise wasn't even 1 day as it began at 4.00pm and ended at 9.00am the next morning. The worst thing was that we let the supplier know we were celebrating our 34th Wedding Anniversary and they appointed us to Cabin 1 which was the worst cabin on the whole boat. It was right next to the engine room on the bottom level. After much insistence on being moved, an attendant managed to move us to another cabin on the same level but it had single beds. This was really disappointing but I guess we got some sleep not being right next to the engine room.